The Royal Cremation of His Majesty King Bhumibol Adulyadej is scheduled for 25-29 October 2017. Thursday, 26 October, will be the royal cremation day, and it has been declared a public holiday by the Cabinet to allow the people to take part in paying a final tribute to His Majesty the late King. The process of the Royal Cremation will last five days. 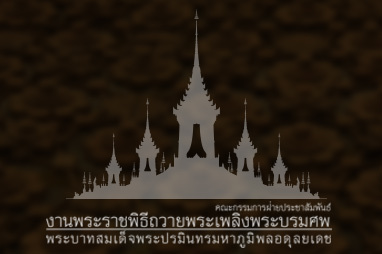 A total of 85 replicas of the Royal Crematorium have been constructed nationwide. Out of this number, 76 are located in 76 provinces and nine in Bangkok and nearby provinces. Sandalwood flowers have been used in cremation ceremonies in Thailand since olden days, as it is believed that the fragrance of sandalwood will lead the souls of the deceased to heaven. In the Royal Cremation of His Majesty King Bhumibol Adulyadej, the traditional sandalwood flowers, to be used by His Majesty King Maha Vajiralongkorn Bodindradebayavarangkun and members of the Royal Family, have been made from fragrant sandalwood trees taken from the Kui Buri National Park in Prachuap Khiri Khan. The organizing of festivities for the Royal Cremation Ceremony is an age-old tradition, performed since the Ayutthaya period. It is meant for the general public and signals the ending of the official mourning period at the same time. The public performances also manifest the greatness of the monarch. The Royal Cremation of His Majesty King Bhumibol Adulyadej is scheduled for 25-29 October 2017.